was painted from an unknown photo reference because I felt some sort of unexplained attachment to it. I had no idea where it was. 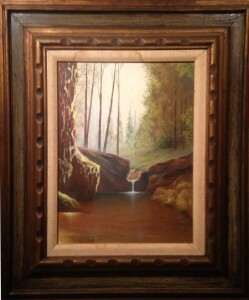 Later, my Mother gave me a dozen old paintings that were painted by my great grandfather. 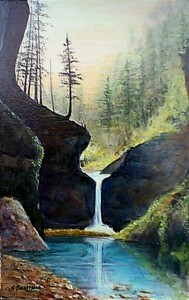 Astonishing to me, one of the paintings was of this very same place. 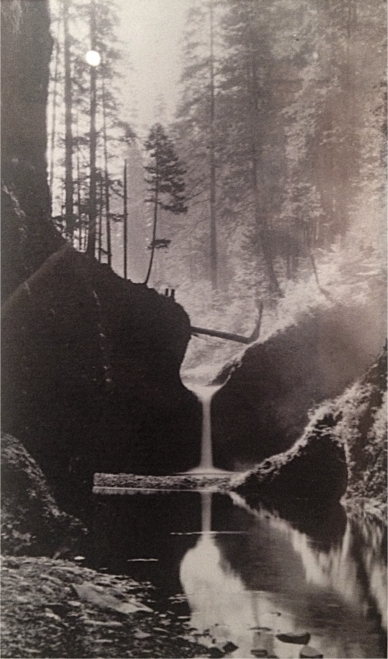 A few years after that, a photographer friend saw the two pictures and said “You’ve been to Punch Bowl Falls?”, I told him the story, and he later produced a black and white photo he had taken from nearly the same vantage point. It’s interesting to observe the difference in water levels and vegetation through the passing of time in the different images.